You are currently running an older browser that may not support all features of the enrolment forms. We recommend that you use the Chrome browser for a smooth enrolment experience. There are many forms of grief and loss and how we express our grief differs from person to person. 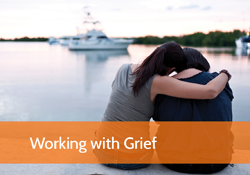 In this session we will explore; the grieving process; different types of grief; symptoms and reactions to grief; differences in grieving; what to say/not say and how to assist.